Cooking the rice - The only difference between cooking brown rice and white rice is the water to rice ratio. Because of the outer bran coating, more water and a longer cooking time is needed for brown rice. In my case the cup that I used for this recipe (yes I halved) took almost 45 minutes of cooking time. Everything else – it comes together rather quickly once you get the rice cooled off. I stayed pretty true to the recipe except, I added walnuts, and did not have green onions so instead I up the cooked onions that it called for. I went heavy on the curry, because I love curry. I did cook my corn with the onions, just to give it a pop and added the raisin to it at the last 5 minutes of cooking to get them plump. Instead of cooking oil for the dressing, I used olive oil. I’m in total agreement with the original recipe owner, Sara, of The Kitchen. This is a great salad to make it your own. You can add anything to it. The sweet and sour dressing is a good match up to any combination. The next time, I’m adding a can of tuna to see what the results would be. Tom added some chopped chicken to make it a bit heavier for his dinner and it totally worked. But whichever way you decided to make it, remember your gutsiness. All recipes out there started from something else, it’s up to you to make it your own. Make the brown rice by following the manufacturer’s instructions. Then drain and rinse under cold water. Heat the cooking oil and butter in a saucepan. Add onions and cook over medium heat until the onion is soft and translucent. Add the corn and season with salt and pepper. Add the curry powder to the onions/corn and cook for a further 1-3 minute. Turn off the heat and set aside to cool. Make the dressing by mixing the sugar, olive oil, salt and white vinegar in a jar (or bowl), shake well until combined. 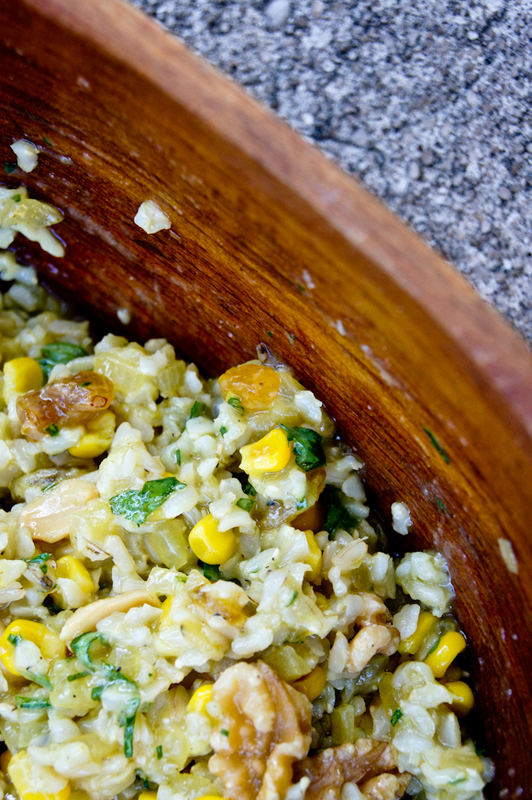 Combine the cooled rice with the walnuts, peanuts, corn/onion mixture, spring onion and parsley. Fold the dressing through the rice salad. Check out what the other Gutsy Cooks have been making in their kitchens here.